The natural light of the sun is always welcome; it not only lights up the interiors of your building but also keeps it warm and comfortable, thus filling you up with energy and vigor, always. However, there is a flip side of the prolonged exposure to the sunlight. Though it generates a fair amount of Vitamin D in individuals; the Ultra Violet (UV) rays can cause several types of skin cancers if you are exposed to the direct sun rays for a considerable length of time. Moreover, apart for the health hazard, the rays of the sun can increase the indoor temperature significantly, thus compelling you to use the air conditioners, overtime. This will cause the energy bill to shoot up; additionally the rays can leave behind faded household items and can put you off through distracting glares. You must be thinking that are there any ways to protect your home as well as yourself from these harmful effects of the sunlight? You will be glad to know there are a number of ways, which you can implement not only to save yourself, but at the same time can enjoy limited warmth of the sun rays. 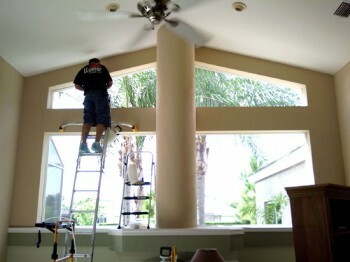 The best among these is tinting the windows of your house, using window films. The window films tint your house windows in the same manner as these do for your automobile windows, thus filtering the sunlight and protecting your family, you and your household items. Up to 99% of the harmful Ultra Violet (UV) rays get deflected. Block the solar heat to keep the interior of your house cool and save on energy bill. Protect not only the furniture but also the interior from fading. Protect your family as well as yourself from skin damage. Take a moment, examine the current color of your sofa or carpet and judge yourself as to whether these look the same way when you had purchased these! They do not and like your wooden flooring, old photographs and wallpaper these look washed out and faded. One more thing; compare the condition of the furniture in the rooms which receive relatively more sunlight to those which have lesser exposure to the sunrays. You will be surprised to see the negative effect of the UV rays on the furniture with more sunlight. Apply these films to your windows and protect not only the new furniture that you are planning to purchase, but also the existing ones from further damage in the same manner that these films do to protect your car audio components, navigation systems and leather seats from the harmful rays of the sun. You can manage and control the humidity inside your house with a central air system, but it can do very little to restrict the sunrays from coming inside; thus the temperature shoots up and the air conditioner works over time to keep the temperature down. As a result, you not only end up paying more on energy bill but it also harms the environment; leading to global warming. Tint your windows, save on energy cost and do your bit not only to save the environment but also to protect your family as well as yourself.